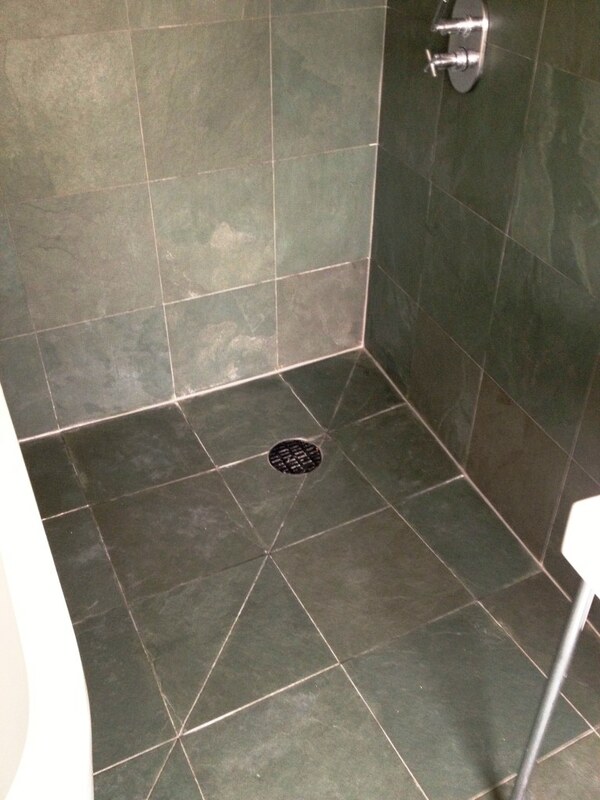 A builder had made a real mess of this customer’s new Slate tiled wet room. 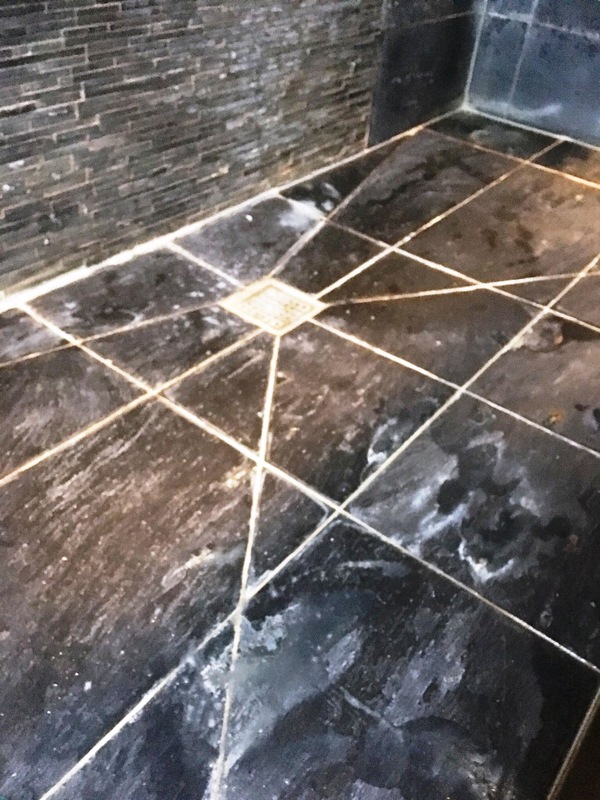 When installing any new natural stone tiles, it is always recommended to apply the sealer before grouting, since – as was the case here – the porosity of the stone can cause the grout to stick with to the stone, leaving a terrible blotchy and uneven appearance. What’s more, once stuck to the stone, the grout is essentially impossible for the tiler to remove. 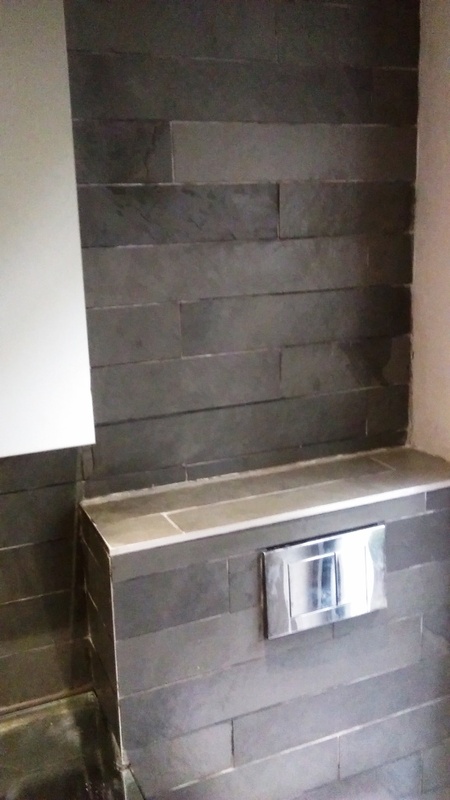 In this wet room, light grey grout had been left smeared all over the Slate tiled walls, causing haze in some places. Understandably, she was very upset with the situation and was eager to secure some professional help, courtesy of the Kent Tile Doctor. I travelled down to the property, situated in Sevenoaks, Kent, to set the problems right. To begin, I had to tape up all the chrome and metal fittings found around the bathroom to stop them coming into contact with the cleaning products. 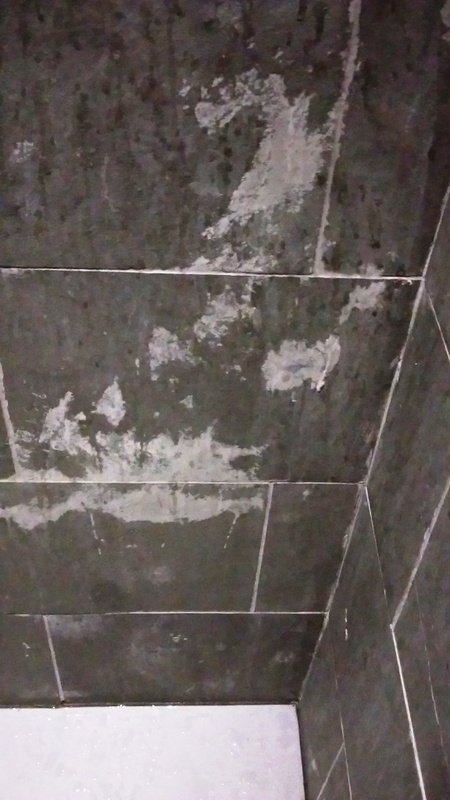 I them started the restoration by applying Tile Doctor Acid Gel, which is a PH1 blend of Phosphoric and Hydrochloric acids for the removal of grout haze. As it comes in a gel form, this product is especially effective on vertical or sloped surfaces, where more dwell time is required. A liquid product would, of course, simply run off the tiles. So, working on small areas at a time, I allowed the gel to dwell for around five minutes, before agitating the solution with a pan scrubber, and rinsing the gel off with water. 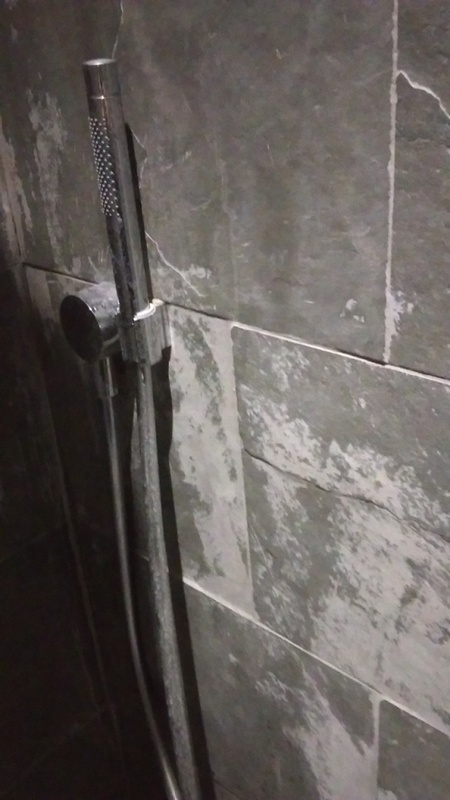 Once I had completed this process on the whole of the wet room, I allowed the tiles to dry out before repeating the process on some of the areas suffering from thicker smears of grout. When I was happy that I had removed all of the grout smears, I ensured that all the tiles were dry before applying Tile Doctor Stone Oil. This product is an easy-to-apply, pre-polish impregnating sealer which is ideal for low porosity stone and also suitable for more porous stone, such as Terracotta. It is also specially designed to enhance the natural colours and textures of tiles, and improve mechanical strength once cured. 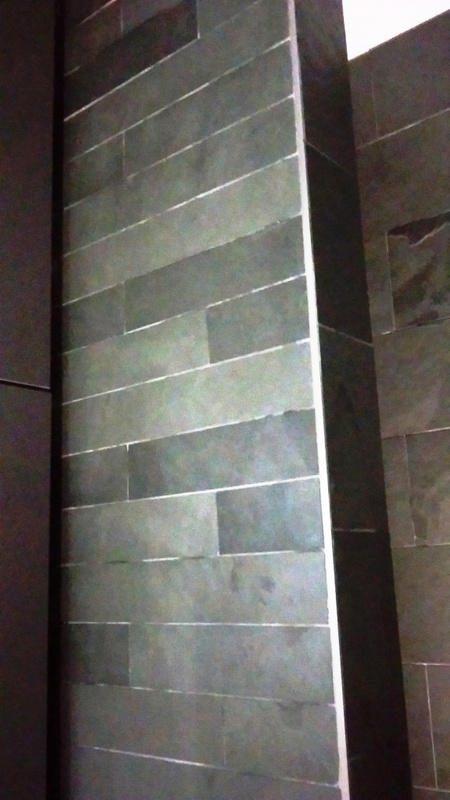 The oil is particularly effective when used on dark stone, like this Slate, as it really helps to deepen the colour. I returned the next day to seal the tiles completely using one coat of Tile Doctor Ultra Seal to lock in the Stone Oil applied the previous day. Ultra Seal is a premium, no-sheen, natural-look, solvent-based penetrating sealer formulated to provide maximum stain protection. 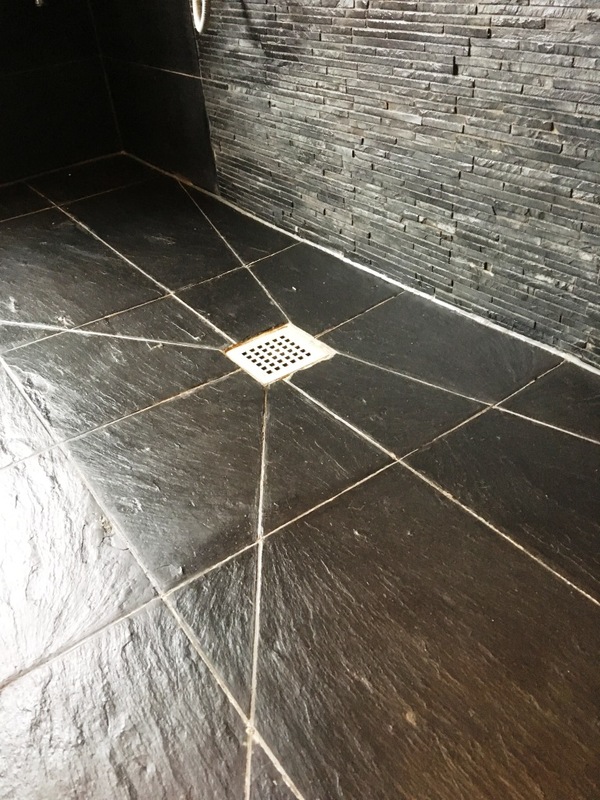 It allows moisture vapour transmission and is an excellent grout sealer. 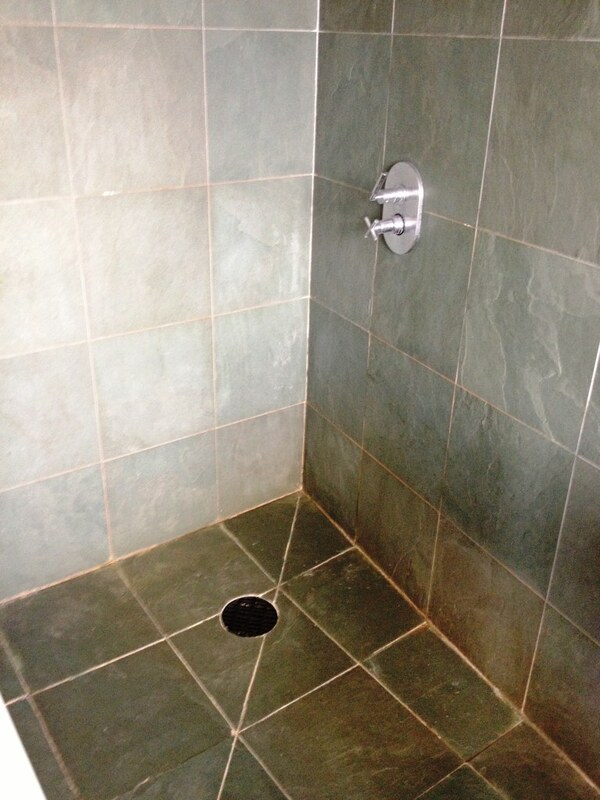 The customer was very happy with the results, which set this difficult problem right. In particular, she was worried that all of the tiles would have to be removed and the entire wet room would have to be redone. Thankfully that is no longer the case, and she can enjoy this fantastic Slate feature. All she needs to be concerned with now is ensuring the tiles are regularly maintained with professional care, including having the sealer topped up as and when necessary.